I don't often buy clothes from City Chic. I have found their clothing runs large so I never know what size to buy online. I do however love all their clothing! 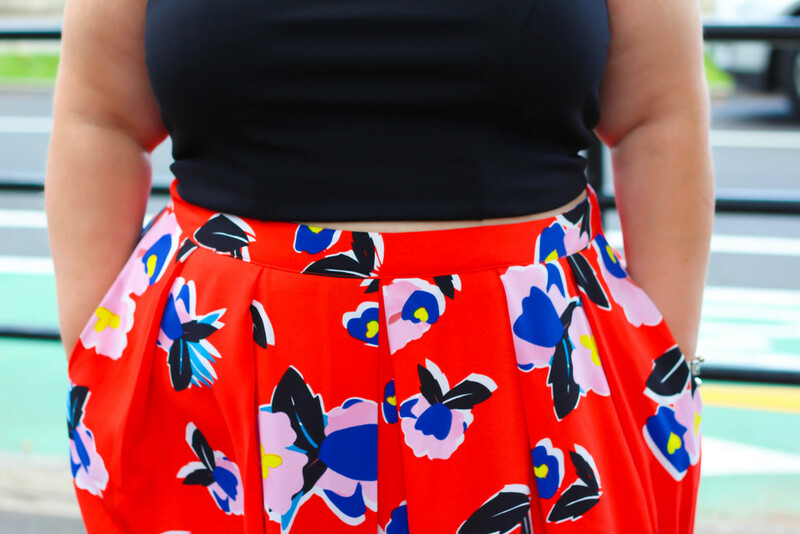 I signed up for a free month of Gwynnie Bee (review coming soon) and while browsing I saw this vibrant printed skirt and instantly fell in love. Totally adorable and chic! I love a high waisted circle skirt in the summer. This is my go to look for meetings at work. I wanted to make this look a little trendier so I paired this with a black crop top from Charlotte Russe. The crop top was a little long on me so I just folded it up to get the look I wanted. I completed this outfit with my go to black strappy heels. I'm not sure what I'm going to do when summer is over because I live for these shoes! Let me know what you guys think! I hope you guys enjoyed. Pls make sure to subscribe!